Congratulations to so many of our pupils, from S1 to S6, whose numerous achievements were recognised at our Celebration of Success Assembly. These included awards for academic excellence, large numbers of merits, representing the school at various events and awards such as Crest and Reading for Gold. The certificates were presented by our House Captains. Once again we had an excellent Christmas Concert, which played to a packed audience for families and friends. Our many talented musicians, vocalists and dancers confidently entertained the audience with a fantastic range of pieces, in large groups, small groups and as individuals. This was, of course, the culmination of many weeks of rehearsals and our thanks go to Mr Russell, Mr Clarke and our Music Instructors for all their work in preparing the young people. Many thanks too, to all staff and pupils who assisted in making the event such a success. 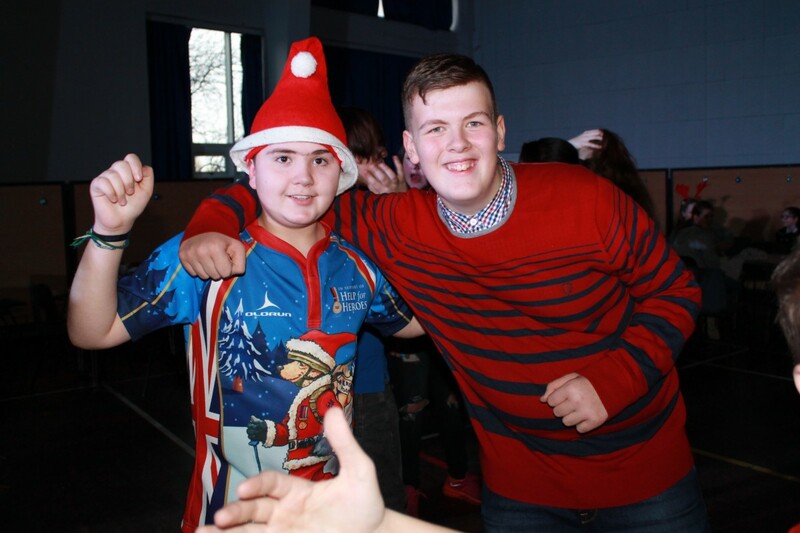 Pupils in S1 and S2 enjoyed a great afternoon Christmas party, playing games and dancing. All the young people joined in the fun and had a great time. Many thanks to the PE department, other staff and senior pupils, who organised the event. 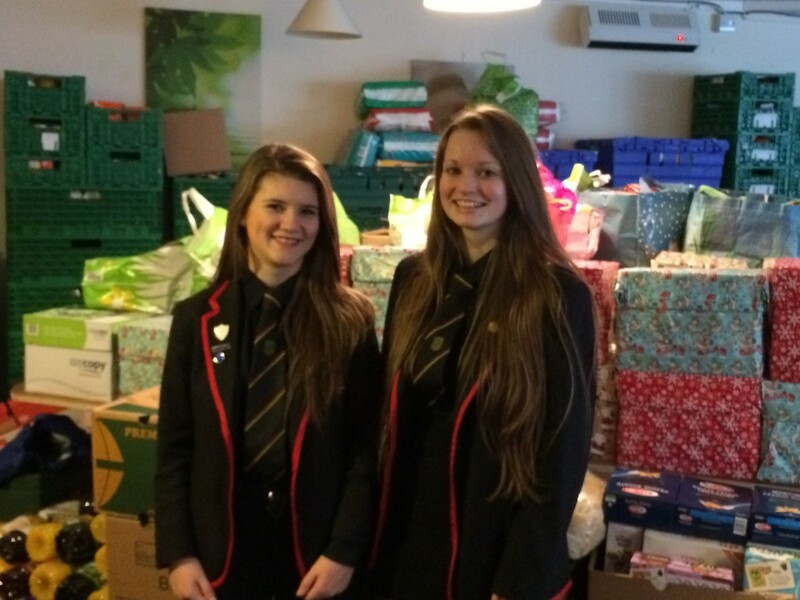 Chanelle Gallagher and Mairi McLean, on behalf of the school, delivered around 1150 items to the Kilsyth Foodbank last week, following the week of collections within the school. This was a great total and was gratefully received by the staff at the Foodbank. Well done to Chanelle, who led the whole project and saw it all through to its conclusion. 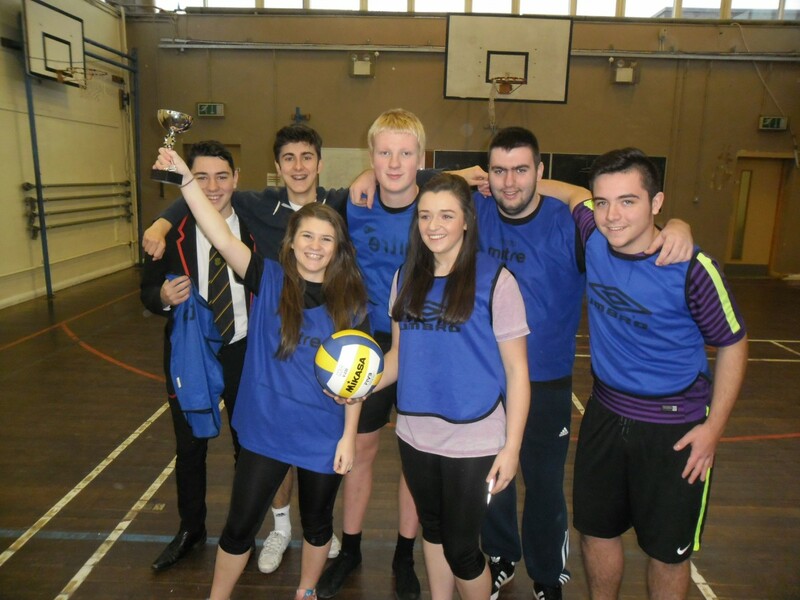 The inter-House Volleyball tournament took place last week and, at the end of the competition, Antonine was victorious. Dumbreck was second followed by Balmalloch in third and Colzium in last place. The games were played in the truly competitive and friendly spirit. Well done to all participants! The school will re-open on Wednesday 6th January, at 8.55 a.m. We hope everyone has a great holiday, a Merry Christmas and Happy New Year. Tickets are still available for our annual Christmas Concert, on the evening of Thursday 17th December. The price is £5 for adults and £3 for concessions, and tickets can be purchased from the Music department. This is a great way to celebrate Christmas, with friends and family and to enjoy the entertainment provided by our young people. Thank you to everyone who contributed items for the foodbank collection. These will be delivered to the Kilsyth Foodbank this week. Plans for Crazy Day and the last day are now in full swing and we are looking forward to plenty fun and celebration, while also raising lots of money for charity. We hope that pupils will all support the end of term events, so we can raise as much as possible. S4 pupils have been very busy finding out about the work of local charities. This is part of an enterprise initiative, sponsored by the Wood Foundation. In the spring, the pupils will make a pitch for their charity to be awarded a £3000 grant from the Wood Foundation. Our cafeteria has undergone a refurbishment last weekend, with a few finishing touches to be completed by January. We hope that pupils will greatly enjoy this new-look facility within the school. The school will close on Tuesday 22nd December, at 2.20 p.m. and will re-open on Wednesday 6th January, at 8.55 a.m. We hope everyone has a great holiday, a Merry Christmas and Happy New Year. Collections for the Kilsyth Foodbank are well underway and we urge everyone to give generously. In particular, the Foodbank would welcome donations of mince pies, Christmas crackers, chocolates, tuna/salmon, shortbread, fruit juice/Shloer, tinned ham, crackers and cheese. Our last day of collecting will be Friday 11th December. The S1/S2 Christmas Party will take place on the afternoon of Monday 14th December. Pupils have been issued with information about this. Our three Kilsyth Academy Christmas cards have now been sent to the printers. Congratulations to Holly Shaw, Jake Muir and Olivia Elliott (all S2), who designed the cards. 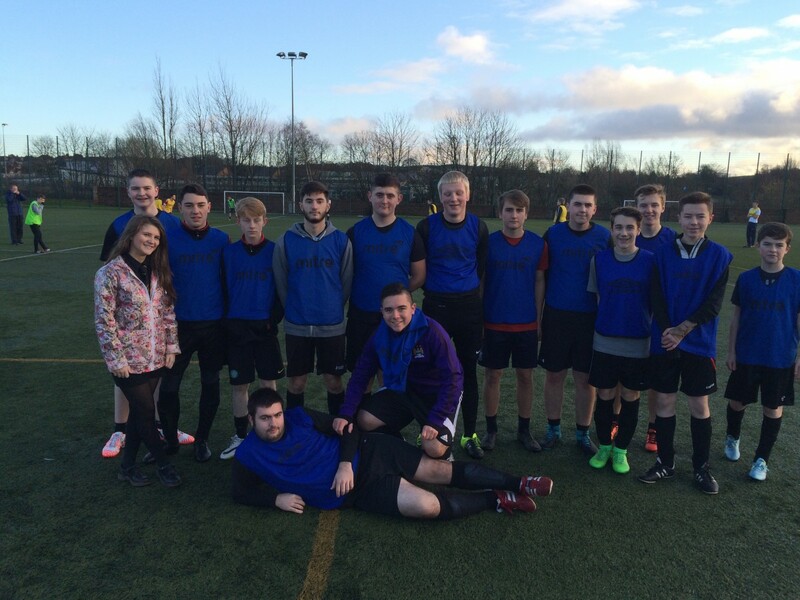 The inter-House football competition took place last week. It was played in good spirits, with some exceptional goals being scored. Antonine House won the overall event, with Dumbreck House coming second, Balmalloch third and Colzium fourth. Well done to all participants and to the PE Department for organising the event. We also had inter-House Table Tennis tournaments for boys and girls. In the boys’ event, Mike Chebe took 1st place for Colzium, Maciej Jelito was in 2nd place for Balmalloch, Scott Leslie was third for Antonine and Lewis Cameron was fourth, for Dumbreck. In the girls’ competition, Alex Burke took 1st place for Dumbreck, Emily Muir was second for Antonine, Nicola Wilson took 3rd place for Colzium and Connie McFarlane was fourth for Balmalloch. Well done to all! Crazy Day will take place on Monday 21st December and, by now, pupils should be paying their £3.00 donation to participate. Lots of morning activities are planned and staff and 6th year have been rehearsing furiously for the afternoon show. All proceeds will go to the three charities selected by the Pupil Council – Strathcarron Hospice, SAMH and Mary’s Meals. Let’s do them proud!